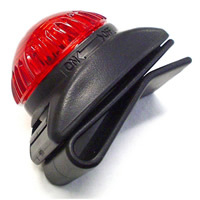 The Guardian LED Safety Light is the lightest, brightest, toughest light in its class! It's easily seen when when boating in low light conditions. Just clip it on your PFD or boat and go! Very lightweight, yet tough and durable, it will not restrict movement and may be attached anywhere. The Guardian LED Safety Light is a affordable, wearable safety whenever you need to be seen in the dark.